Upadesha Saram is a set of 30 verses composed by one of the greatest saints of recent times - Bhagavan Ramana Maharshi. These verses are a condensed version of the teaching given by Lord Shiva to a group of Rishis who are unfortunately committed to just the performance of Vedic Rituals. Lord Shiva comes down to teach them that one has to rise above the addiction to just rituals and their benefits and finally get to committed to Self Knowledge. Because Self knowledge is the only way to solve the basic human problem of being dissatisfied with whatever we have and obtain. One has to ultimately understand that the happiness we are seeking lies within ourselves and we just have to know how to tap into that endless resource. The verses deal with the following topics - Limitation of Action, Role of Action, Likes & Dislikes, Harmony in Life, Karma Yoga, Bhakti, Worship, Praise of the Lord, Contemplation, Attitude of Non-Duality, Non-duality as the highest devotion, Quietening the mind, Yoga of knowledge, Self-enquiry, Enquiry into the nature of God, Nature of knowledge & Happiness is the truth of the Self. The uniqueness of the text is that the teaching is very direct, in the characteristic style of Ramana Maharshi. He takes us straight to the core of the human problem, which is the ego or ahankara, and gives us powerful methods to deal with it. There were 3 classes on Upadesha Saram each day by Swami Sarvananda. 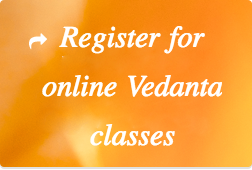 Additionally there was a class daily on Introductory Vedanta by Sri. Jithendranath Vaidyanathan. There was also an interactive question and answer session every evening by Swami Sarvananda. You can find audio recordings of the classes here. * Schedule is subject to minor modifications.